The Raceway in Sonoma is pleased to offer all uniformed scouts and scout leaders a free ticket to the GoPro Indy Grand Prix of Sonoma, August 25, 2013! All Scouts and scout leaders that show up in their Class A uniform will be admitted FREE! Upon arrival you will be issued a complimentary ticket to the Turn 9 Terrace Scout Section. Specially priced scout tickets have also been made available for scout friends and family. Additional tickets in the scout section can be purchased for just $20.00. (Normally $55.00) . For every scout ticket purchased through dedicated links, Sonoma Raceway will donate $10 to scouting! Did you watch Indy 500 the past weekend? From qualifying at the last minute a week ago, to advancing 11 spots to finishing 19th at the race, there were many intense moments for the BSA Motorsports team. However, nothing compares to the dramatic finish at the last half lap. Check out this video if you haven't yet. If this is the kind of excitement you enjoy, here's a chance to experience it, on location, real time. Once again, BSA's #19 car will be coming to Northern California for Indy Grand Prix of Sonoma. Scouts and leaders in Class A uniform will be admitted free. Discounted tickets ($20, normally $55) are also available to friends and family. 50% of each ticket sold will be donated to Scouting. More information available here. 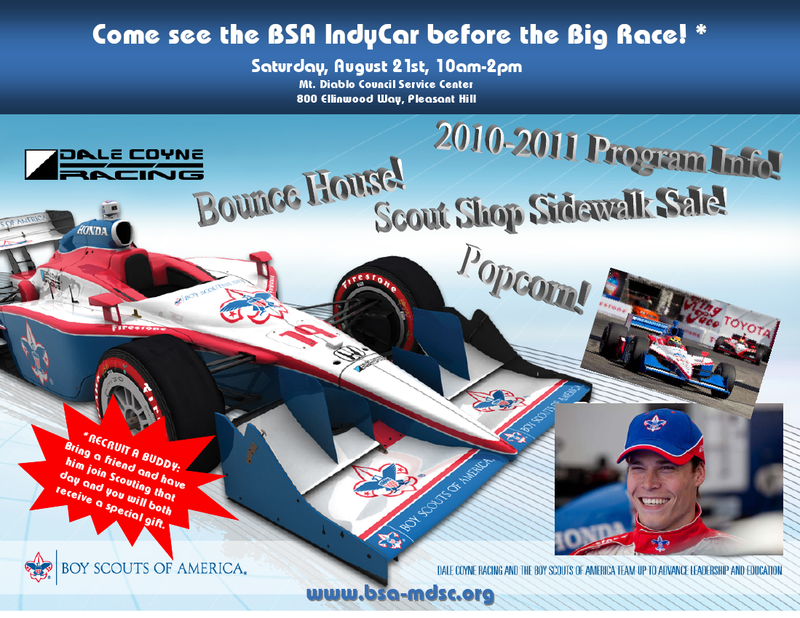 BSA IndyCar Showcase at Scout Council Office! Start your engines! The official BSA IndyCar and driver, Alex Lloyd, will be visiting the Council Service Center on August 21st. The car will be on display at a council wide celebration. Don’t miss out on this exciting opportunity to see the car before the big race! Click on the flyer for details. BSA IndyCar Showcase and Six Flags Discovery Kingdom! Join the Boy Scouts of America Mt. 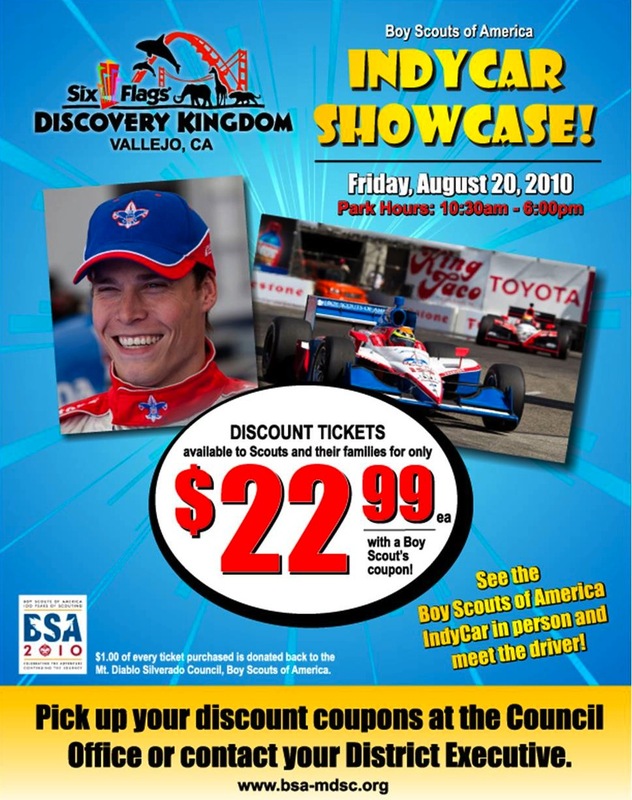 Diablo Silverado Council here at Six Flags Discovery Kingdom on Friday, August 20 2010 from 10:30 a.m.-6 p.m. You will have the opportunity to see the IndyCar and driver here in person at the park before their race at Infineon. For additional information, or to pick up discount coupons, please visit www.bsa-mdsc.org, or the Mt. Diablo Silverado Council office. $1.00 of every ticket purchased with this discount will be donated back to the Boy Scouts of America, Mt. Diablo Silverado Council. Click on the flyer for details.